Background: Skin diseases are among the most common health problems worldwide and are associated with a considerable burden. Eczema is such a skin ailment which cause psychological, social and financial burden on the patient and their families. Management of eczema with antibiotics, antihistamines, steroids etc., are available but even after their use relapses, recurrences and other complications are very common. Aim : The aim of this study was to assess the efficacy of leech application in the management of vicarcikā0 (Eczema) with standard clinical parameters viz. Eczema Area and Severity Index (EASI) score, SCORing of Atopic Dermatitis (SCORAD) Index and Dermatology Life Quality Index (DLQI). 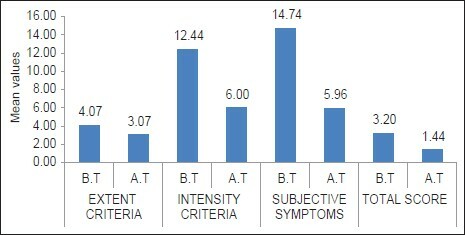 Materials and Methods : An open labeled clinical trial study without control group was conducted with 27 patients having the classical symptoms of vicarcikā (Eczema), selected as per the inclusion and exclusion criteria from outpatient department and inpatient department sections of Shalya Department, S.V. Ayurvedic Hospital, Tirupati. Minimum four sittings of leech application were carried out with 7 days interval. Pre- and post-treatment evaluation of the patient was done with Eczema Area and Severity Index (EASI) score, SCORing of Atopic Dermatitis (SCORAD) Index and Dermatology Life Quality Index (DLQI). Statistical Analysis : Analysis of the data was done with Student's paired t-test. Results : The total EASI score showed considerable reduction up to 54.45% (P < 0.01) and the SCORAD Index significantly reduced by 55% (P < 0.01). The life quality of the patient calculated by DLQI improved significantly by 62.36% (P < 0.01). Conclusion : Leech application gives significant relief for the symptoms of eczema. The life quality of the patient also improved significantly after leech therapy. No adverse reactions were reported during the entire course of study. Management of eczema involves topical applications such as emollients, antipuritic lotions, steroids, coal tar and zinc paste etc., oral antibiotics, sedative antihistamines, corticosteroids and immunosuppressive agents. Even after their use relapses, recurrences and other complications are very common. Indiscriminate use of these drugs can cause vomiting, diarrhea, stomach upset, allergic reaction, peptic ulcer, neuropsychiatric reactions, diabetes, diminution of libido, Cushing's syndrome, etc. Vicarcikā has been mentioned in Ayurvedic classics under kṣudra kuṣtha and also under kṣudra roga. According to Āyurveda, Rakta duṣti is one of the prime causes of skin diseases and among the śodhana karma; bloodletting is considered as the best treatment for skin diseases. According to Suśruta, if a person regularly undergoes bloodletting, he can develop resistance against all types of skin diseases. In the present study, among the various methods of bloodletting, leech application was selected. Leech application is specifically indicated for tvak doṣa and biochemicals released from leech saliva have anti-inflammatory, antibiotic, thrombolytic actions  etc., further leeches can be easily administered with less complication and are cost effective. Thus in this study an attempt is made to assess the efficacy of leech application in the management of vicarcikā (Eczema) with standard clinical parameters viz. Eczema Area and Severity Index (EASI) score, SCORing of Atopic Dermatitis (SCORAD) Index and Dermatology Life Quality Index (DLQI). An open labeled clinical trial was conducted on 27 patients having the classical symptoms of "vicarcikā" (Eczema). The patientswere selected from outpatient department and inpatient department sections of Department of Śalya, S.V. Ayurvedic Hospital, Tirupati as per inclusion and exclusion criteria. The criteria for diagnosis were based up on the classical signs, and symptoms of vicarcikā described in mādhava nidāna. The inclusion criteria included patients of age group 16-70 years (as bloodletting is indicated for this age group  ). The exclusion criteria included, patients having secondary infections, bleeding disorders, diabetes mellitus, heart diseases, tuberculosis, leprosy and generalized eczema. A specific case sheet was prepared, and the patients of the present study were examined in detail as per case sheet. Routine hematological investigations and urine examinations were carried out before and after treatment to rule out the other associated pathology. The patients were included for study after taking written consent for ethical clearance. Written consent was taken from the parents of the patients below 18 years of age (the trial study was not registered in clinical trial registry, but the study has been registered as M.S (Ayu) thesis in Dr. NTRUHS, Vijayawada). Nonpoisonous leeches were identified  and collected from fresh water sources; they were stored in mud pots. On the day of application, the patient was placed on proper position according to the site of lesion. Leeches (no. as required) were kept in turmeric water to make them active, increase appetite and free from natural urges, after keeping the leeches for 45 min they were put in fresh water. Lesion is cleaned by water and dried with cotton. After this, rubbing of the skin was done as per need. For this purpose, either sterilized cotton bandage pad or thick thread of jute was used. The activated leeches were applied over the lesion site. Leech become elevated like a horse shoe or raised in an arched position from its neck that indicates that they are sucking the blood vigorously or strength fully. After catching the site, leeches were covered with wet cotton pad and regularly sprinkled with cold water. The leeches usually detach from the site after sucking the vitiated blood or have to be removed by sprinkling salt over it when the patient complains pain or itching. The following precautions should be taken during leech application: The bleeding and clotting time of the patient should be normal; care should be taken in handling leeches, that is, they should be handled gently and the leeches have to be covered with wet cloth. The follow-up was carried out up to 6 months from the end of the treatment with interval of 15 days to rule out progression of the disease and adverse reactions. Statistical analysis of the collected data was done with Student's paired t-test. GraphPad InStat software (GraphPad Software. Inc, San Diego, USA) used for statistical analysis. The assessment of results was made by adopting the standard international scoring methods - EASI Score, SCORAD Index and DLQI. The average age of patients was 50.12 years and 70% were male. Itching and oozing were among the main complaints of the patients, and 62.96% of patients had chronicity of 1-5 years. [Table 1] shows the overall effect of leech application in Vicarcikā with reference to EASI Score. Highly significant results were noted in parameters like redness, thickness, scratching and lichenification. However, insignificant result was seen in the percentage of area. The total score of EASI was highly significant with 54.45% of reduction [Figure 1]. [Table 2] shows the overall effect of leech application in vicarcikā with reference to SCORAD Index. In the parameters of SCORAD Index, intensity criteria and subjective symptoms showed highly significant results, but, on the other hand, insignificant result was seen in extent criteria. The total score of SCORAD Index was highly significant with 55% reduction [Figure 2]. [Table 3] shows the overall effect of leech application in vicarcikā with reference to DLQI. The effect of leech application with reference to DLQI was highly significant. Leech application provided an improvement of 62.36% in the quality of life of the patient [Figure 3]. During the follow-up period of 6 months, the progression of disease was static in all cases. There were no adverse reactions noted during the therapy and also in follow-up. Vicarcikā, a type of kśudra kuṣṭha is found to be mainly caused by viruddhāhara and rakta duṣṭi. Frequently śodhana is indicated in Kuṣtha due to involvement of bahu Doṣa,  which even holds good for vicarcikā. raktamokṣaṇa is one among the paṅca śodhana which is highly useful in kuṣtha, as kuṣtha is a rakta pradoṣaja vyādhi. Among different methods of bloodletting, leech application is considered to be more scientific and safe. The medicinal leech is a beautiful symbol of "give and take" and is sustainable resource management. Hirudo medicinalis is one of the oldest surviving animals on earth. The first documented accounts of the use of leeches for medicinal purpose is from the time of extreme antiquity, more than 2500 years before in Ayurvedic texts, then long later during the period of Hippocrates. Dhanvantari, the physician of gods and the god of Ayurveda hold a leech in one of his hand. This simply suggests the importance of leeches in the medicinal field by ancient Indian science. Leeches have and will always be thought of as the "wonder doctors" of science. The probable mode of action of leech application in vicarcikā can be explained in the following way. The anti-inflammatory substances present in leech saliva like Eglins and Bdellins  are responsible for reduction of erythema (redness) and oozing. Leech application induces granulation tissue formation  which in turn results in collagen formation causing keratolysis resulting in reduction of thickness in eczema. Leech application induces microcirculation  and reduces inflammatory components like lymphocytes; these factors play an important role in reducing itch impulse (in turn scratching). Leech application reduces acanthosis (thickened epidermis) and scratching which are the causative factors for lichenification. Leech saliva contains hylaurinadase which has antibiotic properties  and that may be responsible for the reduction of oozing in vicarcikā. These substances reach epidermis and dermis by the action of enzyme hylaurinadase. It has been proved through laser Doppler flowmetry that there is a significant increase in superficial skin perfusion following leech application, especially 16 mm around the bitting zone. Therefore, a regional antiphlogistic, thrombolytic and antibiotic effect by these substances enforced by hylaurinadase might be the possible reason of improvement by treatment with leeches. The jaws of the leech pierce the skin so that potent biologically active substances can penetrate into the deeper tissues. Hylaurinadase (spreading factor), an enzyme in leech saliva, further facilitates the penetration and diffusion of these pharmacologically active substances into the tissues. In the present study it was found that, leech application gives significant relief to the symptoms of eczema such as erythema, edema, oozing, excoriation and lichenification, etc., The life quality of the patient also improved significantly after leech therapy. In the study, during the follow-up period of 6 months the disease progression was static in most of the patients. No adverse reactions were reported during the entire course of study. Hence the application of leeches in the cases of vicarcikā can be an effective treatment for chronic eczema. The study suggests the utility of leech application in other inflammatory disorders. The authors are grateful to Hanifin et al. (developers of EASI score), Europian Task Force on Atopic Dermatitis (developers of SCOARD index) and Department of Dermatology, Cardiff University School of Medicine (developers of DLQI). Bickers DR, Lim HW, Margolis D, Weinstock MA, Goodman C, Faulkner E, et al. The burden of skin diseases: 2004 a joint project of the American Academy of Dermatology Association and the Society for Investigative Dermatology. J Am Acad Dermatol 2006;55:490-500. Sehgal NV. Eczema/Dermatitis. In: Text Book of Clinical Dermatology.4 th ed. New Delhi: Jaypee Brothers Medical Publishers (P) Ltd; 2004. p. 19. Shaw BP, Jain AK, Kalita D. Clinical study of somaraj curna (vernonia anthalmintica) and nimbadi oil on vicarcika eczema. Anc Sci Life 1982;1:221-2. Yadavji TA, editor. Susrutha Samhita. Varanasi: Chaukamba Krishnadas Academy; 2008. p. 283. Yadavji TA, editor. Susrutha Samhita. Varanasi: Chaukamba Krishnadas Academy; 2008. p. 318. Yadavji TA, editor. Susrutha Samhita. Varanasi: Chaukamba Krishnadas Academy; 2008. p. 65. Harishastri PV, editor. Vagbhata's Astanga Hridaya. Varanasi: Chaukamba Krishnadas Academy; 2006. p. 323. Michalsen A, Lüdtke R, Cesur O, Afra D, Musial F, Baecker M, et al. Effectiveness of leech therapy in women with symptomatic arthrosis of the fi rst carpometacarpal joint: A randomized controlled trial. Pain 2008;137:452-9. Murthy KR, translator. Sarangadhara Samhita. Varanasi: Chaukamba Orientalia; 2006. p. 255. Pietrzak A, Kanitakis J, Tomasiewicz K, Wawrzycki B, Kozlowska-Lój J, Dybiec E, et al. Cutaneous complications of improper leech application. Ann Agric Environ Med 2012;19:790-2. 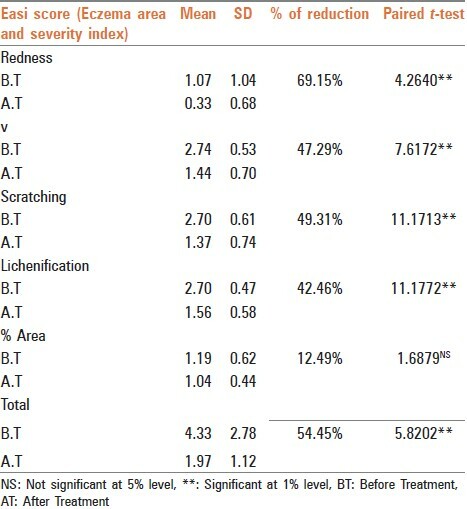 Hanifi n JM, Thurston M, Omoto M, Cherill R, Tofte SJ, Graeber M. The eczema area and severity index (EASI): Assessment of reliability in atopic dermatitis. EASI Evaluator Group. Exp Dermatol 2001;10:11-8. 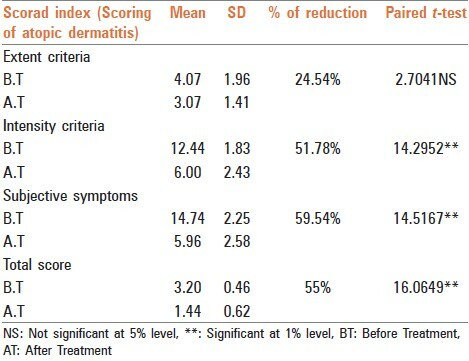 Severity scoring of atopic dermatitis: The SCORAD index. Consensus Report of the European Task Force on Atopic Dermatitis. Dermatology 1993;186:23-31. Dermatology.org. Section of Dermatology, Department of Dermatology and Wound healing, School of Medicine, Cadiff University. Available from: http://www.dermatology.org.uk/quality/dlqi/quality-dlqi.html. [Last cited on 2010 Jun 14]. DermNetNZ. New Zealand: New Zealand Dermatological Society; c2013. Available from: htt p://www.dermnetnz.org/dermatitis/easi.html. [Last created on 2009; Last updated on 2013 May 22]. DermNetNZ. New Zealand: New Zealand Dermatological Society; c2013. Available from: http://www.dermnetnz.org/dermatitis/scorad.html. [Last created on 2009; Last updated on2013 May 22]. [citation format as per format for homepage/website given under ICMJE recommendations]. Yadavji TA, editor. Caraka Samhitha. Varanasi: Chaukamba Krishnadas Academy; 2006. p. 450. Yadavji TA, editor. Caraka Samhitha. Varanasi: Chaukamba Krishnadas Academy; 2006. p. 97. Harishastri PV, editor. Vagbhata's Astanga Hridaya. Varanasi: Chaukamba Krishnadas Academy; 2006. p. 223. Gross U, Roth M. The biochemistry of leech saliva. In: Michalsen A, Roth M, Dobos G, editors. Medicinal Leech Therapy. Stuttgurt: Appl. Wembing; 2006. p. 137-8. Dhiman R, Sen S. Leech therapy and Āyurveda: An anthropological study. In: Pathak RK, editor. Bio-Social Issues in Health. New Delhi: Northern Book Centre; 2008. p. 250. Dhiman R, Sen S. Leech therapy and Āyurveda: An anthropological study. In: Pathak RK, editor. Bio-Social Issues in Health. New Delhi: Northern Book Centre; 2008. p. 248. Zavalova LL, Baskova IP, Lukyanov SA, Sass AV, Snezhkov EV, Akopov SB, et al. Destabilase from the medicinal leech is a representative of a novel family of lysozymes. Biochim Biophys Acta 2000;1478:69-77. Baskova IP, Nikonov GI. Destabilase: An enzyme of medicinal leech salivary gland secretion hydrolyzes the isopeptide bonds in stabilized fi brin. Biokhimiia 1985;50:424-31. Connor NP, Conforti ML, Heisey DM, Vanderby R, Kunz D, Hartig GK. Augmented blood removal after medicinal leech feeding in congested tissue fl aps. J Rehabil Res Dev 2002;39:505-12. Sviridkina LP, Borovaia EP, Makhneva AV. Hirudotherapy in combined sanatorium-spa treatment of patients with coronary heart disease. Vopr Kurortol Fizioter Lech Fiz Kult 2008;12-5.